Percutaneous coronary intervention (PCI) is one of the most commonly performed invasive medical procedures in medicine today. Since the first coronary balloon angioplasty in 1977, interventional cardiology has seen a wide array of developments in PCI. Bare metal stents (BMS) were soon superseded by the revolutionary drug-eluting stents (DES), which aimed to address the issue of restenosis found with BMS. However, evidence began to mount against DES, with late-stent thrombosis (ST) rates being higher than that of BMS. The bioabsorbable stent may be a promising alternative, providing vessel patency and support for the necessary time required and thereafter degrade into safe non-toxic compounds which are reabsorbed by the body. This temporary presence provides no triggers for ST, which is brought about by non-endothelialized stent struts and drug polymers remaining in vivo for extended periods of time. Likewise, nano-theranostics incorporated into a bioabsorbable stent of the future may provide an incredibly valuable single platform offering both therapeutic and diagnostic capabilities. Such a stent may allow delivery of therapeutic particles to specific sites thus keeping potential toxicity to a minimum, improved ease of tracking delivery in vivo by embedding imaging agents, controlled rate of therapy release and protection of the implanted therapy. Indeed, nanocarriers may allow an increased therapeutic index as well as offer novel post-stent implantation imaging and diagnostic methods for atherosclerosis, restenosis and thrombosis. It is envisioned that a nano-theranostic stent may well form the cornerstone of future stent designs in clinical practice. Percutaneous coronary intervention (PCI) is currently one of the most commonly performed invasive medical procedures in medicine today. This procedure is indicated in stenotic coronary arteries, which is a manifestation of atherosclerosis (Figure 1). Since the first coronary balloon angioplasty in 1977, there has been an ever-growing plethora of developments and advancements which have led to the field of interventional cardiology that we see today. With the implantation of the first expanding coronary stent reported in 1986, otherwise known as the bare metal stent (BMS) it was quickly established soon after that patency rates were considerably increased with the use of coronary stents in angioplasty. In contrast to balloon angioplasty, coronary stents prevent exceeded distension of the vessel which may contribute to aneurysm formation. By 1999, coronary stents were implanted in 84.2% of PCI operations. However, in spite of the obvious successes of these new stents over balloon angioplasty, problems emerged in the form of neointimal hyperplasia, which affected 15% to 30% of patients[6, 8-12]. Neointimal hyperplasia is an inflammatory response to the foreign material of the stent, whereby a whole host of inflammatory mediators are upregulated to cause the proliferation of vascular smooth muscle cells which ultimately culminates in the restenosis of the vessel lumen. (A) The progression of atherosclerosis and various therapeutic approaches. Such therapies involve lipid modulation of the blood, decreasing intra-plaque inflammation, thrombosis and angiogenesis. (B) Pro-healing and anti-restenosis approaches post PCI. Anti-inflammatory and anti-proliferative drug delivery as well as light-activated ablation, both of which use nanoparticles can be used to prevent restenosis. Nanofibrous scaffolds emulating extracellular matrix and magnetic nanoparticles delivering endothelial cells can be used to enhance stent strut endothelialization. Copyright © 2013 Elsevier B.V. Reproduced with permission from . Despite the initial success of BMS in PCI, early ultrasound studies indicated late restenosis in vessels with stents compared to those without. In response to these concerns, research was propelled to limit such neoplastic effects with the delivery of antineoplastic drugs. It was through this that the revolutionary drug-eluting stent (DES) was conceived. The DES comprises of a metal scaffold surrounded by a degradable drug polymer coating and with its use, significant reductions in restenosis rates were seen[13-15]. The demand for DES increased dramatically and by 2004, 80% of all of all PCIs were employing this stent. These included the sirolimus-eluting CYPHER™ stent (Cordis Corporation) and the paclitaxel-eluting TAXUS™ stent (Boston Scientific), which were both known to have dramatically low restenosis rates 6 months post-implantation[17, 18]. However, evidence began to mount against DES, with studies concluding late-stent thrombosis (ST) rates being higher than in BMS[19, 20]. ST has mortality rates of up 30% and is a potentially fatal complication . Biodegradable stents (BDS) offer a promising alternative to conventional BMS and DES and it is perhaps interesting to note that the idea of semi-permanent absorbable stents were around long before the emergence of research on in-stent restenosis. These stents provide drug release and vessel patency until it has healed and the stent then degrades into non-toxic compounds. The scaffolds are required to last from 6 to 12 months to allow the healing process to take place and thereafter the presence of the stent cannot provide any advantageous effects, hence the BDS is the most logical approach for the fourth stenting revolution[23-26]. The advantages of the BDS are manifold, with the most key being that it provides no triggers for ST, which is brought about by non-endothelialized stent struts and drug polymers remaining in vivo for long periods of time. Other benefits of BDS may include the reduction in the amount of dual antiplatelet therapy (DAPT), facilitation of the return of vessel vasomotion, late luminal enlargement, late expansive remodelling and adaptive shear stress - all due to the lack of permanence of the stent. Furthermore, the use of BDS allows future surgery or interventions to be performed in vessel areas which have had previous stenting, should this be warranted. Lastly, the use of this stent will allow a level of psychological relief of concern to patients who dislike the idea of having a foreign material in their bodies for the rest of their lives. Presently, BDS comes in either a metallic or polymeric form. There are many different types of polymer, each of which are made of different composites, which give them varying degradation times. One of the most ubiquitous type of polymer is poly-L-lactic-acid (PLLA) polymer, which is found in many medical devices, including absorbable sutures, orthopaedic implants and soft-tissue implants [27, 29]. 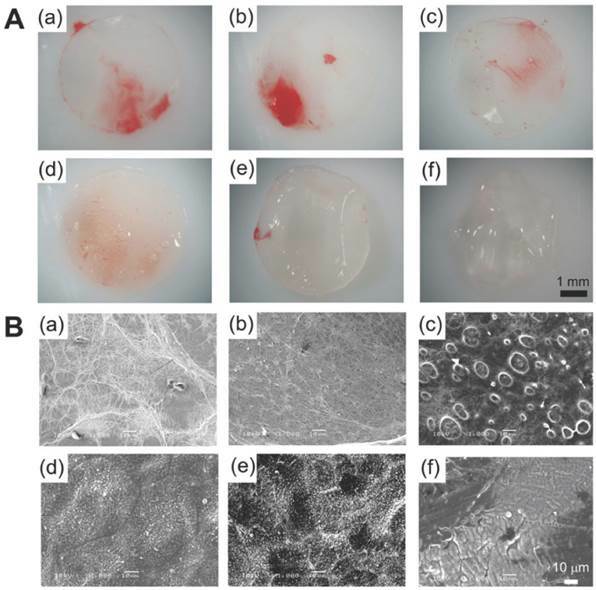 PLLA has also been studied as DES coating material and when combined with citric acid-cross-linked gelatin, the composite has demonstrated good anti-thrombogenic and drug elution properties (Figure 2). The use of the BDS however does not come without its concerns; namely that the polymers offer a reduced radial force when compared to stainless steel stents and have a decreased deformability/ductility. Biodegradable metal stents have also shown promise, most notably being the magnesium variety due to their fast degradation time of around 60-90 days. This type of stent has been shown to have low thrombogenic action and the concentration of magnesium released is believed to be minute when compared to the magnesium concentration of plasma at 0.7-1.0 mmol/L[25, 30]. Moreover, magnesium is not detectable under magnetic resonance imaging (MRI) or computed tomography (CT), which has important implications as it means it does not cause the appearance of artefacts. Nonetheless it is important to note that, as with the polymeric BDS, there are engineering hurdles in design and testing which much be overcome, such as reduced deformability or ductility. There are currently numerous pre-clinical and clinical trials in place assessing BDS, and initial data has shown their use to be a definite feasible option. It hoped that in the near-future, they will available for medical use and in doing so, may be an effective and superior alternative the current BMS and DES. As for future stent designs, enhancements and improvements can be delivered by the use of nanoparticles (NPs) with specific interest in using a theranostic approach. Theranostics refers to using technology which has therapeutic and diagnostic potential, whereby it can not only advance knowledge of a current disease status, but also improve disease outcomes. The essential benefit of theranostic nanomedicine lies in its ability to utilise patient-specific test outcomes to individualise therapies for better results, decreased cost and fewer side effects. NPs have already shown great success in such areas, with particular mention to molecular imaging (especially MRI) and drug delivery. We propose that the application of theranostic functionality in current stent designs can potentiate further improvements. Such advances in stents could include a higher therapeutic index and easy in vivo monitoring of in-stent drug delivery. Moreover, it could potentially provide not only a non-invasive alternative, but also ultrasensitive and precise diagnoses of in-stent stenosis and thrombosis due to enhanced visibility of disease biomarkers[31-35]. Presently, there are over 14 different biodegradable stents (BDS) which are in preclinical and clinical testing worldwide. Two of these stent types are used in clinical practice and have already attained their Conformité Européenne (CE) mark; the Absorb Bioresorbable Vascular Scaffold (BVS) (Abbott Vascular) for coronary artery disease and the Igaki-Tamai® stent (Kyoto Medical Planning Co., Ltd.) for peripheral vascular disease. Many stent struts are composed of polymers of lactic acid and specifically of poly-L-lactic acid (PLLA), with fewer numbers consisting of other types of polymers and metal alloys. Thus, the BDS can broadly be divided into polymer or metallic stents, which are discussed below. The biodegradable or dissolvable metallic stents consist of either magnesium-based (Mg) or iron-based (Fe) alloys[26, 37, 38]. The rationale behind using these particular metals lies in their relatively well understood toxicity and clearance profiles, which makes them logical candidates for metallic stent strut material. Their advantages and limitations are discussed in Table 1 [26, 39]. These metals are alloyed with calcium (Ca), zinc (Zn) and manganese (Mn) as they are well tolerated in the human body. The alloying of Fe with other metals is necessary to alter its ferromagnetism which can reduce MRI compatibility. As for magnesium, it is alloyed to decrease its degradation rate and increase its ductility and strength. For instance, hot extruded Mg-Ca alloy has an improved strength and ductility combination, with a tensile strength reaching 240 MPa with 11% elongation. Presently and to the best of the authors' knowledge, all but one Mg-based and Fe-based coronary BDS are still undergoing preclinical trials, with one Mg-based BDS (the DREAMS 1.0 scaffold) having already entered clinical trials[36, 38]. As for non-coronary applications, metallic BDS has previously been studied in the treatment of infrapopliteal artery lesions. (A) PLLA and citric acid-crosslinked gelatin matrices demonstrated in pictures and (B) scanning electron microscope images. Such composites have been used as DES coating material which allows antithrombogenic and drug-eluting properties. The composite has varying ratios of PLLA to citric acid-crosslinked gelatin: 100/0 (a), 80/20 (b), 60/40 (c), 40/60 (d), 20/80 (e), 0/100 (f). Copyright © 2012 Wiley Periodicals, Inc. Reproduced with permission from . As the only bioabsorbable metallic coronary stent in clinical trials as of yet, the drug-eluting bioabsorbable magnesium stent, DREAMS 1.0 (Biotronik SE & Co. KG), has a degradation time of 9-12 months. This Mg-based BDS is evaluated in the pioneering first-in-man BIOSOLVE-1 trial. In this prospective study, the DREAMS 1.0 scaffold was implanted in 46 patients treated for 47 single de novo coronary artery lesions and at 12 months, the MACE rate was found to be 7%, with no cardiac deaths or scaffold thrombosis. Advantages and limitations of dissolvable metallic stents (Fe and Mg alloys are mainly considered). As well as biodegradable metallic stents, there are also biodegradable polymeric stents which employ a wide variety of polymers, such as those made from lactic acid, glycolic and caprolactone[22, 43-45]. However, by far the most used polymer for BDS is composed of poly-L-lactic acid (PLLA). PLLA is already found in many medical items, including dissolvable sutures and various implants, and itself has a degradation time of 12-18 months. Another polymer used is the polymer-tyrosine derived polycarbonate, which is used in the ReZolve® stent (REVA Medical Inc.) and it primarily degrades into L-tyrosine. Many biodegradable stents have a degradation time between 12 to 36 months and the two that are CE marked (first generation Igaki-Tamai stent and Absorb BVS 1.1) have a degradation period of 2-3 years[36, 46]. Importantly though, the first generation Igaki-Tamai stent is no longer used for human coronary implants since large guide catheters are needed for insertion and heated contrast agents are necessary for stent deployment, which could potentially cause damage to the vessel wall. This stent is now under use peripherally, but preclinical trials are underway for a second generation Igaki-Tamai scaffold for coronary application which employs a smaller catheter for insertion. Thus, presently the only CE marked coronary stent in ongoing clinical trials is the Absorb BVS. The Absorb BVS is composed of a PLLA backbone and coated with poly-D,L-lactide (PDLLA) and 8.2 µg/mm of everolimus (an anti-proliferative drug) in a 1:1 ratio[27, 47]. The PDLLA allows release of everolimus in a controlled manner and by 30 days, 80% of the drug is eluted. Although the stent is radiolucent, two platinum radio-opaque markers in each end allow for clear identification on fluoroscopy and aids accurate post-dilatation and stent implantation. Both polymers of the stent eventually degrade into lactic acid through metabolism in the Krebs cycle, a process which takes up to 2 years to complete. Since the BVS employs the PLA family of polymers, it is necessary to understand how such polymers hydrolyse in vivo over time. The hydrolysis occurs through a nucleophilic substitution that is catalysed by either acids or bases, for example by water catalysis, which causes a chain scission reaction at an ester bond (Figure 3). Where: Mn(t) is the number-average molecular weight after degradation time 't', Mn(0) is the number-average molecular weight before degradation, and k is the hydrolytic degradation constant. Hydrolytic degradation of the PLA polymer family. Copyright © 2013 Europa Digital & Publishing. Reproduced with permission from . The degradation of the PLLA scaffold can be categorised into 3 stages. Firstly, water diffuses into the scaffold and hydrolyses ester bonds resulting in a decreased molecular weight. Secondly, there is scission of amorphous chains linking crystalline areas whereby scaffold cracks may be observed. Lastly, polymer chains are able to diffuse out and be degraded by the body. As well as understanding polymer hydrolysis of BVS, various design specifications of BVS 1.0 and 1.1 can be appreciated. The first generation of the BVS (BVS 1.0) consists of repeated circumferential out-of-phase zig-zag loops joined together by thin bridges (Figure 4, A and C). The BVS 1.0 was assessed in the ABSORB Cohort A trial which included 30 patients. This trial revealed the device was safe and feasible for clinical use, with a 3 year MACE rate remaining at a low 3.4%. After the ABSORB Cohort A trial, various improvements followed such as an alteration in the processing resulting in a longer duration of radial support, a new in-phase zig-zag design which permitted uniform vessel support and allowed everolimus to be applied to the stent more consistently. Other enhancements included allowance for storage at room temperature, when before it was necessary for storage below -20 °C and the improvement of stent security to prevent dislodgement. These enhancements resulted in the newer, second generation BVS 1.1 (Figure 4 B, D and E) in which important design aspects are discussed below [49, 54]. Many design considerations of the BVS have been put in place to mimic the traditional metallic DES, such as those that allow achievement of high radial strength and flexibility. These stent characteristics are desirable until the vessel has healed, after which the scaffold has no added benefit and can be a hindrance for vessel dilatation, for example when exercising. The scaffold degradation in the BVS naturally warrants different design criteria to metallic stents and consequently it can be said that there are two distinct physiological responses in the two stent scenarios. This connection between BVS stent phases and physiological responses is depicted in Figure 5. The stent phases can broadly be divided into 3 distinct sections: revascularisation, restoration and finally resorption. (A and C) BVS 1.0, the first generation BVS with out-of-phase zig-zag loops and (B, D and E) BVS 1.1, the second generation with in-phase zig-zag loops. (C) The red circular and green outlines demonstrate the unsupported cross sectional areas which are larger in BVS 1.0 than in (D) BVS 1.1. (E) Illustration the newer in-phase zig-zag loops which allow more uniform vessel support and increased consistency of drug application. Copyright © 2013 Nature Publishing Group, a division of Macmillan Publishers Limited. Copyright © 2013 Europa Digital & Publishing. Reproduced with permission from  . A graphical representation of the 3 BVS (1.1) stent phases. The phases are revascularisation, restoration and resorption which all coincide with various physiological responses. 80% of everolimus-elution (green curve) occurs within 28 days of implantation and luminal support (red curve) is provided for at least 3 months. Copyright © 2013 Europa Digital & Publishing. Reproduced with permission from . During the revascularisation phase, the BVS should emulate metallic stents as closely as possible in their: good deliverability to the target site, deployment of scaffold with minimum recoil, drug delivery at a controlled rate and high radial strength. Good deliverability of the stent to its necessary site is essential and scaffold flexibility is important for this to be achieved. Head to head tests of flexibility between the ABSORB Cohort B device (which is the BVS 1.1, a second generation BVS to BVS 1.0) and XIENCE V (a conventional DES, Abbott Vascular) have indicated that, in fact, the BVS has greater flexibility at a statistically significant level (Figure 6). It is important to note that catheters during testing were kept the same, so catheter flexibility had no bearing on the result. As for radial strength, the BVS 1.1 used in the ABSORB Cohort B trial is similar to that of XIENCE V and other metallic DES which demonstrates the device has the appropriate radial strength parameters, as shown in Figure 7. The second phase of the BVS, otherwise known as the restoration phase marks the transition from an actively supporting stent to a more passive scaffold whereby vasomotion of the vessel is restored. The final resorption stage starts when PLA is degraded into lactic acid and is released into the surrounding region, such as tissue and blood. The abundance of clinical trials dedicated to the BVS attest to its promise as being the first bioabsorbable polymeric stent to be approved by the United States Food and Drug Administration (FDA). Table 2 summarises the trials of BVS. These clinical trials can broadly be categorised into comparative stent studies, whether between the two BVS generations or between BVS and other stents[56-62] or BVS assessment studies[47, 63-69]. 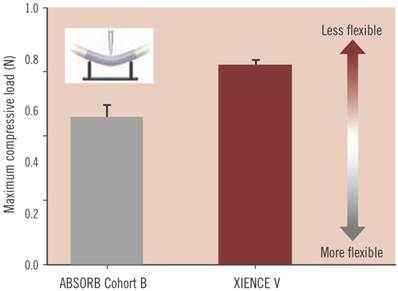 The maximum compressive load needed to bend the ABSORB Cohort B device (BVS 1.1) and XIENCE V (a metallic DES), which is an indication of flexibility. The BVS 1.1 has greater flexibility at a statistically significant level, where p = 0.004. Copyright © 2013 Europa Digital & Publishing. Reproduced with permission from . 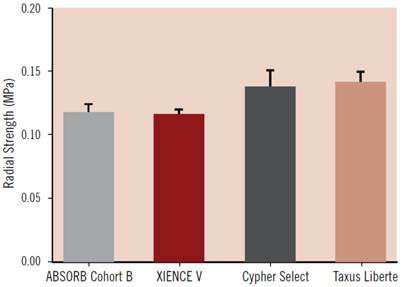 Acute radial strength of the ABSORB Cohort B device (BVS 1.1) compared to metallic DES such as XIENCE V, Cypher Select and Taxus Liberte. Data obtained using MSI RX550 radial expansion force gauge. Copyright © 2013 Europa Digital & Publishing. Reproduced with permission from . A summary of Bioresorbable Vascular Scaffold (BVS) Stent clinical trials. Ormiston et al 2008 ABSORB cohort A trial 30 To assess the feasibility and safety of the BVS 1.0. At 6 month follow up the neointimal area was minimal and low stent area obstruction was observed. At 1 year post implantation, the rate of MACE was 3.3% and there were no stent thromboses. Surreys et al 2009 ABSORB 30 To assess the safety of BVS using clinical outcomes and various imaging techniques. Luminal area enlargement was found using OCT and intravascular ultrasound between 6 months and 2 years, which was due to a decrease in plaque size. At 2 year follow up the BVS was safe with no cardiac deaths or stent thromboses recorded, and only one myocardial infarction (non-Q wave). Okamura et al 2010 ABSORB trials (cohort A and B) 8 To compare strut distribution in vivo of BVS 1.0 and BVS 1.1. BVS 1.1 has a different longitudinal strut distribution to BVS 1.0, which indicates that the new stent as a reduced maximum circular unsupported cross sectional area (MCUSA). Brugaletta et al 2011 ABSORB trials (cohort A and B) 60 To compare the polymeric struts of the first generation (Revision 1.0) BVS to the second generation (Revision 1.1) BVS. A less reduced DC and NC was observed in cohort B (Revision 1.1) at 6-month follow up using IVUS-VH compared to cohort A (Revision 1.0). Gomez-Lara et al 2011 ABSORB trials (cohort A and B) 24 To assess the difference in neointimal response, bioresorption process and late shrinkage between BVS 1.0 and BVS 1.1 and using OCT. Neointimal thickness, neointimal area, luminal losses, absolute and relative shrinkages were higher in BVS 1.0 than BVS 1.1 at 6 month follow up. SPIRIT FIRST and II trials 147 (total of analyzed patients from all trials) To assess and compare the acute recoil in vivo of BVS 1.0 and BVS 1.1 with Xience V. The absolute acute recoil is higher in BVS 1.1 compared to Xience V and similar to BVS 1.0, but these differences are not statistically significant. Brugaletta et al 2012 ABSORB cohort B trial 58 To assess the circumferential healing process of ABSORB BVS (Revision 1.1) at 6 months and 12 months. No difference found between 6 months and 12 months in relation to the neointima area and neointima mean thickness using OCT, however symmetry of the neointima thickness was higher at 12 months. (total of analyzed patients from all trials) To assess the incidence of SBO following BVS implantation BVS had a 6% incidence of SBO in 435 patients. Theranostics refers to the emerging field of medical technology which provides the dual functionality of therapy and diagnostics on a single platform. The advantages of nanoparticles offering theranostics are multi-faceted (Figure 8) and may greatly improve stents of the future. The scale of such therapeutic particles (such as those conjugated with drugs or genes) allow for longer circulation, delivery to specific sites, and improved ease of tracking delivery in vivo by embedding imaging trackers[71, 72]. Moreover, these solutions not only offer a controlled rate of therapy release but also protection of the implanted therapy itself from pre-mature degradation. Likewise studies have shown an increase in drug therapeutic index when delivered using nanocarriers. 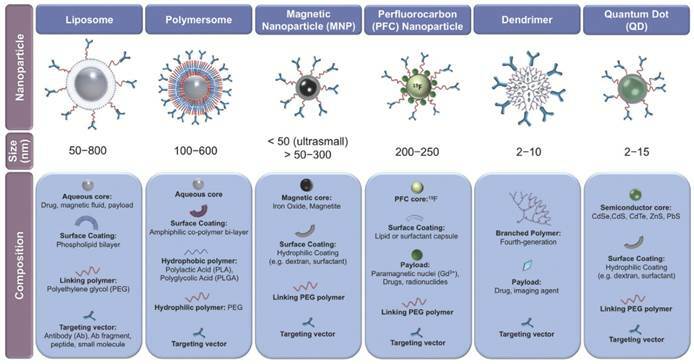 The use of theranostics nanoparticles (NPs) in the targeting and imaging of cancer cells have widely been studied, including malignancies of the lung, pancreas, breast, ovaries as well as many others[73-75]. There has been particular interest in the last 20 years of nanoparticle delivery to tumour sites through manipulation of their vascular hyperpermeability and abnormal lymphatic drainage[76-80], to which numerous nanocarriers are utilised currently, such as those of Abraxane® (Celgene Corporation) and Doxil® (Janssen Products, LP)[81-84]. There are many classes of theranostic NPs, with varying sizes and compositions (Figure 9). Such devices may be of immense value in stent systems since they may provide improved therapeutic pathways in the treatment of in-stent thrombosis and restenosis in comparison to current techniques as well as offer novel post-stent implantation imaging and diagnostic methods all integrated into a single theranostic stent platform. Furthermore, the stent can be considered as an implant, which therefore localizes the drug delivery (as opposed to systemic drug delivery), keeping potential toxicity to a minimum. Various DES using NPs for drug release have been studied in animal models in order to reduce late stent thrombosis and restenosis and such preclinical trials have demonstrated marked success and illustrate the potential role for NPs in localizing drug delivery in stents. For example, in vivo delivery of imatinib (an inhibitor of platelet-derived growth factor receptor through inhibition of receptor tyrosine kinase) by bioabsorbable polymeric NPs has shown a 50% reduction in in-stent restenosis when compared to BMS and fluorescein isothiocyanate (a fluorescent marker) eluting stents. Likewise significant suppression in restenosis has been achieved in NP elution of both gene and drug (VEGF gene and paclitaxel) after 1 month, in comparison to the TAXUS paclitaxel-eluting stent. Although gene or drug NP-eluting stents currently remain experimental and are not yet FDA approved, they offer a promising alternative to conventional drug delivery stent systems. Since the BDS aims to circumvent late in-stent restenosis and thrombosis by eventual degradation of the polymer (or metal) which is proposed to be the initial trigger, it is possible that NP drug or gene elution could further effectively suppress such physiological responses. Such NPs, like liposomes, dendrimers or other forms, with drug or gene cargo may be designed for attachment to cell specific ligands like those on platelets or local smooth muscle cells for targeted delivery. Moreover, controlled delivery may be achieved through nanoparticle responsiveness to local cues, in order to maximise delivery at the target site and minimize systemic adverse effects. Depiction of a theranostic nanoparticle. Such multi-functionalized nanoparticles may be used for carrying a drug payload, molecular imaging, drug delivery, visualisation using fluorescence probes, X-ray imaging, contrast reagents, ultrasonic assistance and specific targeting of ligands. Copyright © 2013 Ivyspring International Publisher. Reproduced with permission from . Classes of various nanoparticles with theranostic properties, compositions and sizes included. Copyright © 2013 Elsevier B.V. Reproduced with permission from . There is an abundant array of NPs used in the treatment of vascular diseases, including vascular stenosis, MI and ischaemia of the lower limbs. The range of NPs used for these purposes can broadly be divided into various categories (Table 3) such as metallic NPs (such as iron NPs coated with gelatine ), carbon NPs (such as carbon-carbon NPs loaded with paclitaxel ) and polymeric NPs. Polymeric NPs include core shell NPs  (which are essentially polymeric micelles), poly(D,L-lactide) NPs  and also poly(lactic-co-glycolic) acid (PLGA) NPs encapsulating the VEGF gene  or pitavastatin . Other polymeric NPs include poly(ethylene oxide)-modified poly(epsilon caprolactone) NP, otherwise known as PEO-PCL NPs, which have demonstrated to significantly increase anti-proliferative mechanisms of human aortic smooth muscle cells (Figure 10) . Other NPs also exist in the form of liposomes combined with viral vectors [95, 96], liposomes delivering bisphosphonates (Figure 11) [97, 98] and lastly lipoplexes (cationic lipid and nucleic acid complexes) delivering the VEGF gene . Many of these NPs have been used to treat vascular stenosis in experimental studies by delivery of anti-proliferative agents. For example, delivery of tyrphostins, a selective inhibitor of platelet-derived growth factor-receptor tyrosine kinase attenuates smooth muscle cell growth in vivo in swine and ex vivo in human arterial tissue and in a decreased in-stent neointima formation[91, 100]. 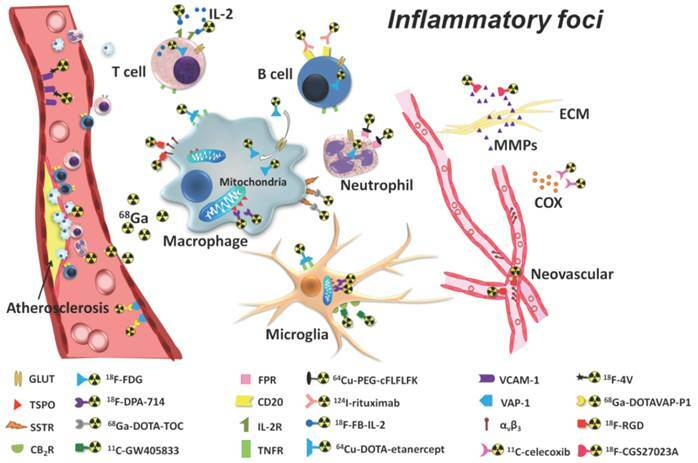 Therapeutic nanoparticles for drug or gene delivery in vascular diseases. Paclitaxel (PTX) and Ceramide (CER) chemical structures and a scanning electron micrograph of poly(ethylene oxide)-modified poly(epsilon caprolactone) NP (PEO-PCL NP). Copyright © 2008 Springer Science+Business Media, LLC. Reproduced with permission from . Microscopy images demonstrating fluorescent liposomal uptake (orange) into vessel walls 24 hours after balloon injury. Lower row is of higher magnification. Liposomes are taken up following injury and with treatment of liposomal bisphosphonates, the vessel wall size is substantially reduced. L = lumen. FL = fluorescent liposomes. BP FL = bisphosphonate fluorescent liposomes. Copyright © 2013 Elsevier B.V. Reproduced with permission from [97, 98]. Molecular imaging may be defined as the use of molecular probes or contrast agents for the purposes of visualisation of in vivo tissues or pathways. Current molecular imaging modalities include MRI, CT, single photon emission computed tomography (SPECT) and positron emission tomography (PET) and US, with the data of many techniques used concomitantly in what is referred to as multimodal imaging. For example, PET has been used in conjunction with MR and CT to combine the increased sensitivity and specificity of PET with the enhanced anatomical imaging of MR and CT . Such techniques have allowed the imaging of various inflammatory markers using numerous tracers such as 18F-FDG (2-deoxy-2-18F-fluoro-D-glucose) Figure 12 . There has been a recent surge in interest on the use of NPs as effective contrast agents, with studies demonstrating that they are able to current enhance imaging modalities by allowing for real-time assessment of drug location and release, improving sensitivity by increasing the contrast-to-noise ratio of surrounding tissues[33, 104], and they also have a high contrast agent payload. Presently, optical coherence tomography (OCT) is increasingly favoured in coronary artery visualization due to its high resolution capabilities and allowance for imaging of various structures such as stent strut malappositions, post-stent restenoses, assessment of stent endothelialization, atherosclerotic plaque and thrombus formation. However, OCT inherently remains an invasive procedure, with the insertion of an intravascular catheter. Furthermore, whilst OCT may be FDA-approved, there are a lack of large-scale studies demonstrating an association between OCT collected data and clinical outcomes[106, 107]. Thus, the use of nanoparticles in molecular imaging offers a possible non-invasive alternative to OCT as well as enhancement of current molecular imaging techniques. Molecular imaging of cardiovascular diseases utilises NPs in one of 2 ways. This can be either through the use of NP contrast agent or the incorporation of contrast agents into various NPs such as liposomes and lipoproteins. Many NP devices have been used in the imaging of CVD and MI, as Table 4 and Figure 13 demonstrate . There have been numerous iron oxide NPs created, such as superparamagnetic iron oxides [108, 109], oxazine fluorophore coated tat-cross-linked iron oxides [110, 111] (iron oxide NPs cross linked with trans-activator of transcription protein of HIV, all to which oxazine fluorophores are conjugated) and monocrystalline iron oxides [112, 113]. Animal studies in hyperlipidaemic rabbits have demonstrated that superparamagnetic particles of iron oxide work by accumulating in atherosclerotic plaques with high levels of macrophages (since they are phagocytosed by these immune cells) causing MRI signal changes . 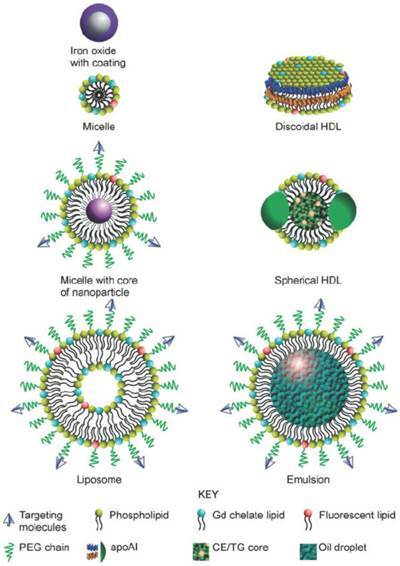 Liposome NPs used for imaging include nanoscale liposomal iohexol  and lipoproteins such as carboxyfluorescein-labeled apoE-derived incorporated into reconstituted high-density lipoprotein NP . Lastly, to aid imaging of atherosclerotic plaques polymeric NPs are utilised (Figure 14) . Such polymeric NPs have been used in hybrid PET/MR imaging of plaques since they can be radio-labelled through conjugation to zirconium-89 and thus allow diagnostic testing on therapeutic efficacy. Various methods and techniques of polymer NP preparations exist. Preparation of PLLA-based magnetic NPs can be achieved through simple emulsion evaporation methods whereby an emulsified mixture containing both magnetic and polymer components is created and consequently evaporated through a rotative evaporator at 100 rpm for about 15 minutes. The formed NPs are then separated using a centrifuge, thereafter washed to eliminate excess materials and lastly the NP suspensions are placed into vials for freeze-drying. Nanoparticles used in diagnostic imaging. Detection of inflammatory foci using PET imaging tracers. The most widely used tracer in PET is considered to be 18F-FDG (2-deoxy-2-18F-fluoro-D-glucose). Copyright © 2013 Ivyspring International Publisher. Reproduced with permission from . Diagram illustrating numerous nanoparticles that may be used for molecular imaging. PEG: polyethylene glycol. apoAI: apolipoprotein A I. Gd: gadolinium. CE: cholesteryl ester. TG: triglyceride. Copyright © 2010 John Wiley & Sons, Inc. Reproduced with permission from . Dextran polymeric NPs present in various plaques. (A) Immunohistochemical stain visualising CD11b+ myeloid cells. (B) Fluorescence microscopy of A showing NP presence. (C) Autofluorescence image of B. (D) Immunofluorescence microscopy of CD11b under higher magnification. 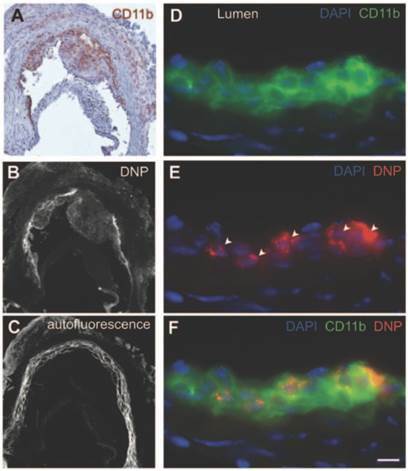 (E) Immunofluorescence microscopy of NPs (see arrows), same image as (D). (F) Images D and E combined where cells staining positive for CD11b show DNP presence inside. Scale bar = 20 µm. Copyright: © 2013 American Heart Association, Inc. Reproduced with permission from . A Hybrid Metallic/Polymeric Bioabsorbable Stent? A dual metallic-polymeric fully bioabsorbable stent system, with a nano-theranostics at its core may revolutionise and transform current coronary stenting procedures. It is envisioned that such a scaffold may provide the mechanical and radial strength, high collapse pressure and low elastic recoil comparable to stainless steel stents yet the effective distribution and time controlled drug release platform which polymers can offer [119, 120]. Furthermore, a nano-theranostic stent core may convey numerous clinical and medical benefits including drug delivery to specific sites thus reducing systemic adverse effects, protection of drug cargo which may allow for lower dose administration, improved ease of nanoparticle tracking and enhanced imaging of the intravascular site for patient monitoring post implantation[35, 71, 72]. The concept of a dual metallic-polymeric bioabsorbable stent has in fact recently been materialised into the FADES stent by Zorion Medical. This scaffold hybrid is composed of PLGA and a magnesium alloy and preclinical trials have indicated complete stent resorption by 90 days as well as a low inflammatory markers present during this time period. However, the possible disadvantage of a dual metallic-polymeric system lies in the possibility of greater stent strut thickness, which may convey a reduction in flexibility. As for stent nano-theranostics, the paucity in the literature poses difficulty in ascertaining the current landscape in this application. Typically, nano-theranostics are delivered systemically; therefore an implant which encapsulates theranostics in its core, giving controlled drug release with enhanced imaging properties could be seen as a more streamlined approach to resolving current stenting obstacles, such as that of late stent thrombosis. In fact, there are porcine models demonstrating the nano-theranostic stent as a pioneering platform for delivery of NPs in targeting CVD. In this study fluorescence markers of fluorescein-isothiocyanate (FITC) were imbedded into cationic PLGA NPs which were then deposited onto stainless steel stents and implanted into either left circumflex or left anterior descending coronary arteries of domestic male pigs. Significant FITC fluorescence was observed in neointimal and medial layers of stented segments just 1 week after stent deployment, when compared to dip-coated stents consisting of thin layers of PLGA with FITC imbedded (Figure 15). 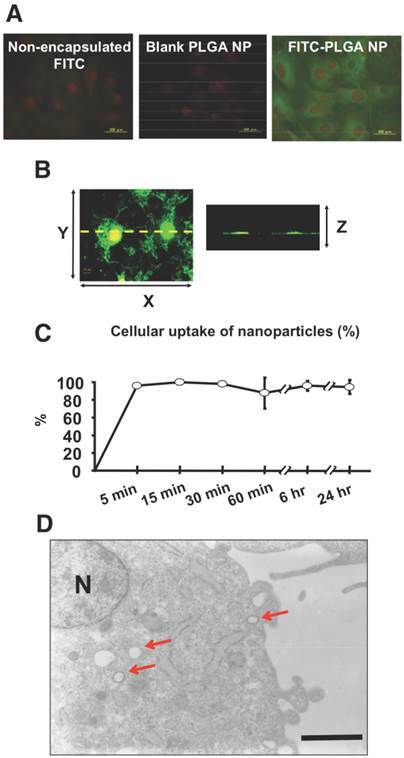 Assessment of FITC-NP release kinetics was also carried out in vitro using human smooth muscle cells (SMCs) from the coronary artery indicating fast uptake and stable presence inside the cells for at least 24 hours (Figure 16). 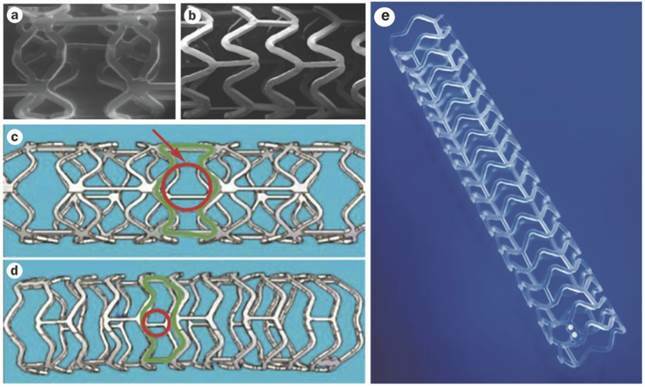 Given the complexities of developing a functional stent, it is envisioned that a paradigm shift towards a nano-theranostic bioabsorbable stent would be evolutionary rather than revolutionary. We envision that the initial step towards such a nano-thernostic stent platform would be the utilization of nanoparticles for localized drug delivery, followed by eventual nanoparticle imaging through nano-sized contrast agents. Possible theranostic candidates for bioabsorbable stent are shown in Table 5. Given the potential seen in PLLA as a material for bioabsorbable stents, we hypothesize that the next-generation nano-theranostic bioabsorbable stents could be made of PLLA dendrimers, with both drug (e.g. everolimus/paclitaxel) and diagnostic iron oxide payload. 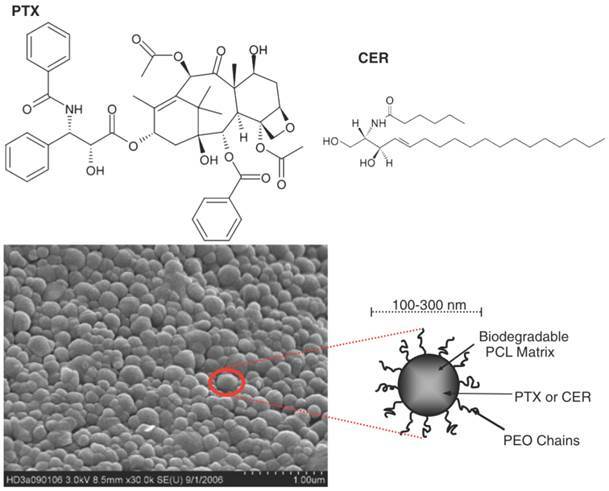 Indeed, Cao et al demonstrated that PLLA dendrimers encapsulating drug (specifically doxorubicin) is in fact feasible. Moreover, Maraloiu et al has also developed a composite magnetic nanovector made of PLLA/rhenium nanospheres capable of carrying MRI contrast agents. Possible theranostic candidates for bioabsorbable stent. 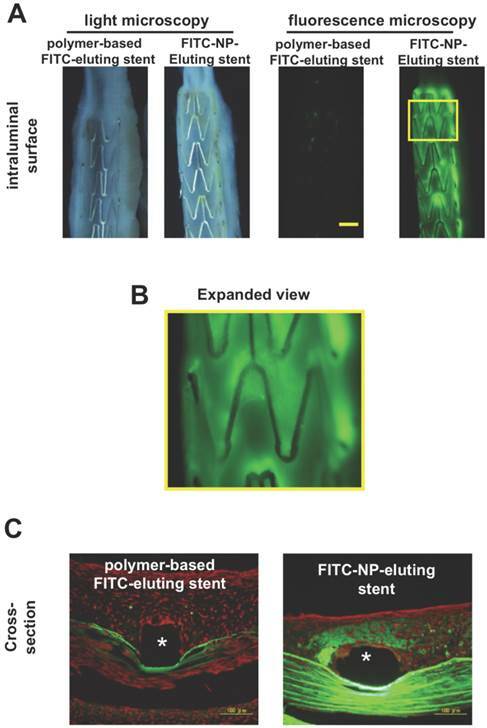 (A) Light and fluorescence microscopic pictures of stented intraluminal coronary artery segments of the FITC-NP-Eluting stent and dip-coated FITC stent (polymer-based FITC-eluting stent). Yellow scale bar = 1 mm. (B) Expanded image of yellow box in A. Image B reveals distinct regions of fluorescence which indicate local uptake of FITC-NPs. (C) Cross-section fluorescence microscopic pictures of FITC-NP-Eluting stent and dip-coated FITC stent. *Stent strut region. Copyright © 2013 Elsevier B.V. Reproduced with permission from . (A) In vitro human coronary artery SMCs visualised using fluorescence microscopy. Cells were incubated with non-encapsulated FITC, blank PLGA-NP and FITC-PLGA NP for one hour at a concentration of 0.1mg/ml. Green indicates FITC fluorescence and red indicates nuclei. FITC-PLGA NP demonstrates the most fluorescence. (B) In vitro human coronary artery SMCs incubated with FITC-NP at 0.1mg/ml visualized using confocal fluorescence microscopy (left image showing XY-axis and right image showing Z-axis of the left image). (C) Percentage of FITC-NP uptake of SMCs over a 24 hour period. (D) Cross-section of SMC visualized transmission electron microscopy. Arrows show FITC-NP uptake. N = nucleus. Copyright © 2013 Elsevier B.V. Reproduced with permission from . Interventional cardiology has witnessed the development of many stent devices over the years. With coronary balloon angioplasty being superseded by BMS, it was soon established that such stents pose risks of neointimal hyperplasia. This paved the way for the revolutionary DES, such as those eluting paclitaxel or sirolimus and the demand for these stents increased significantly. However, such systems were soon presented with the issues of late-stent thrombosis and restenosis, the rates of which were proposed to be higher than that of BMS. Since a stent is required to provide vessel patency and support for 6 - 12 months, any time thereafter may be said to no longer provide any beneficial effects. Hence, the BDS system appears to be an intuitive approach to the next stenting revolution. This promising system aims to circumvent the concerns surrounding current stenting procedures of late-stent thrombosis and restenosis. Furthermore, benefits of BDS may include the facilitation of the return of vessel vasomotion, late luminal enlargement and late expansive remodelling because of a lack of permanence. Moreover, the use of BDS allows future interventions to be performed in vessel areas which have had stents in place. Despite the promises offered by bioabsorbable stents, it is needless to say that many more RCTs comparing the efficacy of these devices against the more traditional stents of DES are still required. The Absorb BVS is the only BDS to obtain a CE mark status quo and is still in clinical trials, in comparison to numerous DES, which are routinely in clinical use presently. Thus, robust testing of BDS to industrial standards as well as presently used stenting methods are required to determine its viability in the scope of PCI. It is proposed that a nano-theranostic bioabsorbable stent could consist of a PLLA polymer stent strut. This is the most frequently used BDS polymer available and has a degradation time of around 12 - 18 months. It is necessary that the stent upholds radial strength values similar to that of metallic stents and previous studies comparing BDS radial strengths to that of metallic ones have suggested this is entirely feasible. NPs such as liposomes, core shell nanoparticles, polymeric NPs or cationic lipoplexes embedded into stent struts are just a few of the array of NPs that may be used for controlled and targeted drug delivery for treating possible stent thrombosis and restenosis. 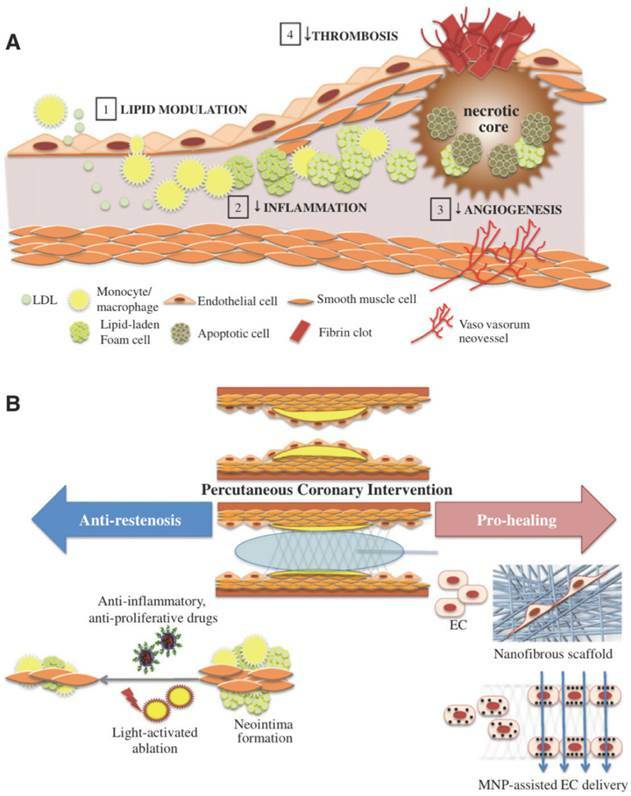 In fact, experimental data on therapeutic liposome-based stents in vivo has demonstrated increased endothelialization. The utilisation of iron oxide NPs in the stent core for precise and real-time monitoring of post-stent restenosis, assessment of stent endothelialization and thrombus formation is envisioned. The use of NPs in vivo necessitates thorough toxicology studies to ascertain possible adverse effects and this field has been coined as nanotoxicology. The unique sizes of NPs have allowed them to cross cell membranes and have potential to access many tissues, which may introduce issues of cytotoxicity and inhibition of cell proliferation . For example, it has been proposed that NPs may interfere which the immune system in ways that may cause immune suppression or stimulation with possible adverse immunotoxic effects as well as interactions with erythrocytes which may result in haemolysis [126, 127]. Thus, comprehensive assessments of chemical and biological interactions of tissues with NPs are critical in demonstrating their safety and viability as long-term medical devices, especially with regards to stenting technology. In conclusion, given the likelihood that bioabsorbable stents would form the basis of stent designs in the future, more research into the use of nano-theranostics on bioabsorbable stent platforms would be of paramount importance and significance. The use of nano-theranostics in stenting would provide an incredibly valuable and streamlined single system, offering both therapeutic and diagnostic capabilities. 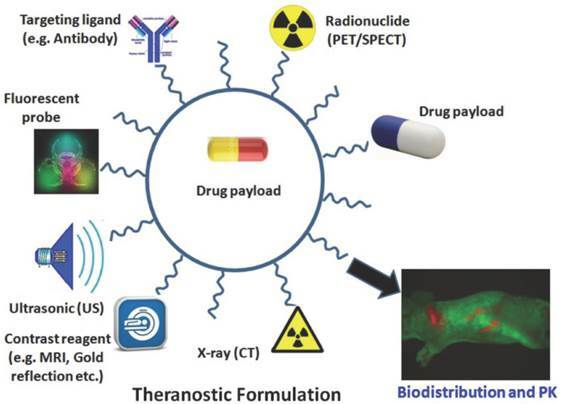 Such capacities are manifold, including the delivery of therapeutic particles to specific sites thus keeping potential toxicity to a minimum, improved ease of tracking delivery in vivo by embedding imaging trackers, controlled rate of therapy release, and protection of the implanted therapy. 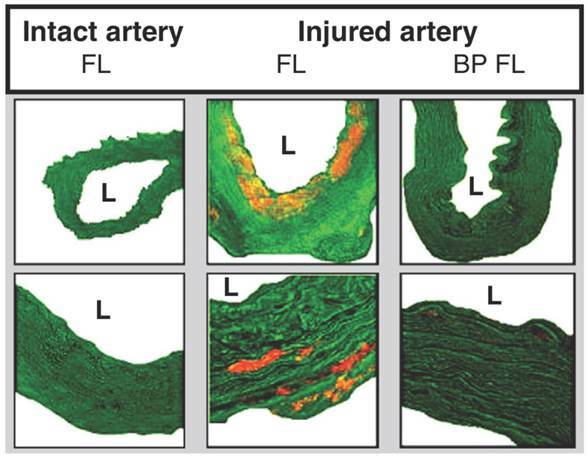 Furthermore, nanocarriers may allow an increased therapeutic index as well as offer novel post-stent implantation imaging and diagnostic methods for atherosclerosis, restenosis and thrombosis. It is therefore hoped that a nano-theranostic stent may greatly enhance the clinical practice of percutaneous coronary intervention in the future. The authors would like to thank the Engineering and Physical Sciences Research Council (EPSRC) - Industrial CASE for funding this research. Buket Gundogan is an MBBS medical student at University College London (UCL), and is currently pursuing her BSc in Surgical Sciences at the UCL Division of Surgery & Interventional Science, working on biomaterials and nanotechnology. Aaron Tan, BSc, MPhil, is a medical student at UCL in the dual-degree clinician-scientist MBBS-PhD programme. He obtained his BSc in Surgical Sciences at UCL, and is currently in his final PhD year under the supervision of Prof. Alexander M. Seifalian at the UCL Division of Surgery & Interventional Science, researching on bioengineered coronary stents utilizing nanotechnology. Dr. Yasmin Farhatnia, BSc, MSc, PhD, is currently a postdoctoral researcher at the UCL Division of Surgery & Interventional Science, working on the development of next-generation coronary stent platforms for both adult and paediatric applications using advanced nanocomposite polymers. She obtained her BSc from Queen Mary University of London (QMUL), and both her MSc and PhD from UCL. Dr. Mohammad S. Alavijeh, PhD, is the Managing Director of Pharmidex Pharmaceutical Services Limited, which has industrial and academic collaborations with the Engineering and Physical Research Council (EPSRC) in training the next generation clinician-scientists. His research and expertise is in drug discovery, cardiovascular disease, cancer, inflammation, and pharmacokinetics. Prior to founding Pharmidex, he was head of drug metabolism, pharmacokinetic and pharmacodynamics (DMPK/PD) at Vernalis Research, and also DMPK team leader at Aventis Pharma (Sanofi). He obtained his PhD from UCL, and previously worked at the world-renowned Institute of Neurology at Queen Square. Prof. Zhanfeng Cui, PhD, DSc, FIChemE, FREng, is the Donald Pollock Professor of Chemical Engineering at the University of Oxford, and a Professorial Fellow of Hertford College, Oxford. He is also director of the Oxford Centre for Tissue Engineering and Bioprocessing at the Department of Engineering Science at Oxford University. He works on the forefront of 3D perfusion of bioreactors, and has founded a spin-off company, Zyoxel, to commercialize TissueFlex®, a microbioreactor for 3D perfused cell culture, and LiverChip™, a lab-on-a-chip microfluidic device that mimics biological organs. He obtained his BSc, MSc, and PhD degrees from China, and his MA and DSc from Oxford University. He is a Fellow of the Institution of Chemical Engineers, and was recently elected as a Fellow of the Royal Academy of Engineering. Prof. Alexander M. Seifalian, MSc, PhD, FIoN, FSB, is Professor of Nanotechnology and Regenerative Medicine at UCL, and director of the Centre for Nanotechnology and Regenerative Medicine at the UCL Division of Surgery and Interventional Science. He has achieved top prizes and accolades from multiple panels including Medical Futures Innovation, UK Trade & Investment (UKTI), and European Life Science. His research interests are in the area of nanoscience and nanotechnology for medical applications, many of which have resulted in commercialization and/or translation into first-in-man studies. He obtained his BSc from Kings College London, MSc from University of London, and PhD from UCL. He is a Fellow of the Institute of Nanotechnology, and a Fellow of the Society of Biology. His group recently developed the world's first bioartificial trachea, which was successfully transplanted into a patient in 2011.